The Oscar-winning actor and one of the most notorious environmental activists, created the Leonard DiCaprio Foundation in 1998 “to support organizations and initiatives dedicated to securing a sustainable future for our planet” (WWF, W/D). Ever since, DiCaprio has been engaged with pressing environmental issues, such as access to clean water, disaster relief, preservation of biodiversity and the Earth’s oceans, among others. DiCaprio currently sits at the board of important environmental organizations, like the World Wildlife Fund, NDRC, Global Green USA and the International Fund for Animal Welfare. In addition to this, the actor has produced two short movies (Water Planet and Global Warming) to raise awareness on environmental topics. DiCaprio also used his production company, Appian Way, to write, narrate and produce his critically acclaimed documentary: The 11th hour. The film was four years in the making and provides the public with an overview of Earth’s problems, as well as exciting solutions for them. 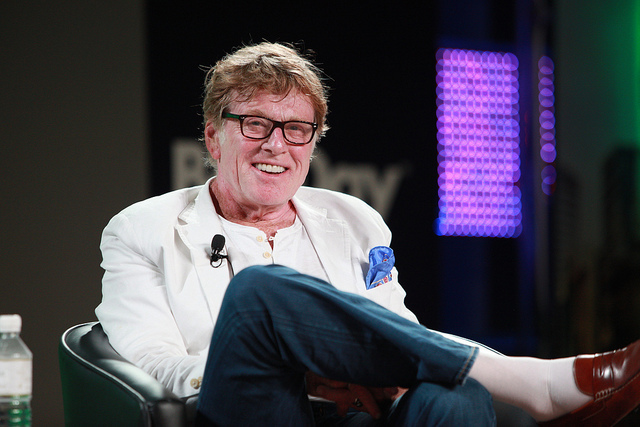 Undoubtedly, Robert Redford is one of the –if not the sole- pioneer in celebrity environmentalism. Without Redford and a small group of other people, the United States would have surrendered the Grand Staircase-Escalante National Monument to commercial hands. Redford’s advocacy kept the 1.7 million-acre out of the reach of farmers and developers until President Clinton closed the area from development in 1996. His current environmental causes cover the protection of the Arctic National Wildlife Refuge in Alaska and awareness on climate change topics, which he started talking about as early as in 1989. Today, 600 million Africans do not have access to electricity. This restricts their activities to daytime or pushes them to use toxic solid fuels and other pollutants for house fires, which causes 3.5 million deaths every year in the continent. Singer and songwriter Akon has first-hand experience, as he grew up in a town without electricity. In 2013, he and childhood friend Thione Niang associated with Samba Bathily to create the Akon Lighting Africa project. They use Bathily’s experience and resources in the solar-energy field to “provide a concrete response at grass roots level to Africa’s energy crisis and lay the foundations for future development”(Akon Lighting Africa, W/D). In less than one year, the project’s private-public partnership model and a network of partners, including Bathily’s SOLEKTRA INT, installed quality solar solutions, including street lamps, domestic and individual kits, in 14 African countries. Akon Lighting Africa has had a tremendous impact in the communities it has visited. Local jobs have been created, working in the project and in the now lit spaces, including community houses, schools and health centres. Moreover, the project seeks to diversify by creating a Solar Academy. This institute, whose launch was announced at the second United Nations Sustainable Energy For All Forum, will educate people on the implementation of solar panels to light Africa (Wikipedia, W/D). Daryl Hannah, an actress born in 1960, is a devoted environmental activist. She lives off the grid in a solar-powered house and drives a car fueled by biodiesel. Hannah also posts weekly video-blogs, in which she discusses environmental issues and sustainable solutions to them. She often is the sole producer and the host of said videos. Moreover, Hannah has an extensive background on hands-on activism. She was briefly incarcerated in 2006 along with 44 other people, including Joan Baez and Julia Butterfly Hill, for protesting the demolition of the largest urban farm in the South Central Los Angeles area. Among the protesters were 350 farmers, their families and supporters, who were threatened with eviction by the new owner of the property, businessman Ralph Horowitz. The South Central Farm, a pinnacle of food production in Los Angeles, had been established in the 90s after the riots that took place in the city. Daryl Hannah has also been linked to Sea Shepherd, with whom she collaborated in Operation Musashi back in 2008. In 2009, the actress was among 31 people arrested for protesting mountaintop removal in South West Virginia. In 2011 she marched in a climate change demonstration, that same year and until 2014, Daryl Hannah was a fierce advocate against the Keystone XL pipeline between Canada and the United States. The project was finally rejected in 2015, by US President Barack Obama. Mark Ruffalo is an actor best known for his role as Bruce Banner in The Avengers franchise. But Ruffalo’s work does not stop there. As an environmental activist, he has worked towards putting an end to hydraulic fracturing (fracking) in upstate New York and all around the United States. Furthermore, Ruffalo founded Water Defense, a non-profit organization focused on ensuring people have access to clean water and holding polluters accountable for their actions. Other causes he supports include the replacement of fossil fuels with renewable energies and the prosecution of Monsanto, the biotech giant. His open letter to Monsanto’s CEO, Hugh Grant, can be read here. A relatively new face in the entertainment business, Somerhalder jumped to fame as Damon Salvatore, in The Vampire Diaries. However, his advocacy for environmental causes frequently puts him in the spotlight. In 2010, Somerhalder helped with the cleanup after the Deepwater Horizon oil spill, in the Gulf of Mexico. That same year he established the Ian Somerhalder Foundation just in time for his birthday and asked people to donate to causes that were dear to their hearts, instead of sending him gifts. Somerhalder opposes GMOs and factory farming and supports more organic ways of not only eating, but harvesting too (Wikipedia, W/D). McAdams is a devoted environmentalist. Her home is powered with Bullfrog energy and she does not own a car, instead choosing to cycle around town. The actress also engaged in cleanup efforts in Biloxi, Mississippi and Louisiana after Hurricane Katrina and was part of the “hair boom” following the Deepwater Horizon oil spill. In 2013, McAdams filmed two promotional videos for the Food and Water First Movement, advocating for the preservation of farmland and water sources in Canada. She also participated in Foodstock, a protest against a limestone mega quarry in Melancthon, Ontario. After collaborating with environmental lawyer Bob Sulnick in a campaign to prevent digging for oil wells in Santa Monica, Danson went on to co-found the American Oceans Campaigns, which merged with Oceana in 2001. Currently, Danson and his wife, Mary Steenburgen, are board members at Oceana, which is “the largest international advocacy organization focused solely on ocean conservation” (Oceana, W/D). Their work at Oceana has been prolific, with Danson writing a book titled: “Oceana: Our Endangered Oceans and What Can We Do to Save Them” (Wikipedia, W/D). Known for widely acclaimed movies, such as Léon: The Professional and Black Swan, Portman has an impressive career portfolio. Along with her acting chops, she pursued studies in Psychology at Harvard University and is a polyglot. Portman is also a vegan, although she swapped briefly to vegetarianism to meet her baby’s demands during pregnancy, but returned to her usual diet after birth. More recently, Natalie Portman has lent her voice to the calls for divestment in oil and coal companies that several Ivy League universities sponsor. Watson, widely known for her role as Hermione Granger in the Harry Potter franchise, is deeply committed to using her platform to speak up and out about important issues in today’s society. Most notably, Watson is the face of the UN #HeForShe campaign, which seeks equal rights for women. Watson is also involved in sustainability, and advocates for the recycling of waste and its incorporation in garments. Watson has also called for the use of organic fabrics. What Is An Environmental Activist?